This section gives an overview of roads and tracks in Scotland from the first tracks of prehistoric man to Roman roads, then through the Dark Ages to a brief "golden age" in early mediaeval times when the great abbeys built roads and bridges and which was brought to an end by the Wars of Independence. Routes continued to develop but efforts at road making under the statute labour system proved inadequate for the needs of the agricultural and industrial improvements of the 1700�s. The turnpike system developed to meet these and lasted to the late 1800�s when roads became the responsibility of local authorities. The Department of Transport assumed responsibility for a network of main roads in 1919. This has continued to the present time. As the ice retreated some 10,000 years ago, small groups of hunter gatherers explored what is now Scotland. They moved along rivers and the coast and had summer and winter camps in different localities. Later populations took increasingly to farming and raising livestock in more permanent settlements. This was so successful that by the time of the Romans, Scotland was well populated with an extensive network of tracks. In their initial campaign the Romans explored much of southern Scotland as shown by their marching camps. Shortly thereafter many of these were replaced by forts and a network of roads built to connect them. There are two main lines of road on the east and the west of Scotland with linking roads and an extension north into the highlands. The roads remained in use even into the middle ages and many stretches can still be seen today. This was a turbulent age, precipitated by the departure of the Romans. In Scotland, the southern tribes were under attack both from Ireland and tribes north of the Antonine Wall. A little later the Angles expanded their territory in Northumberland up the east side of the country as far as Angus and over to Galloway and Ayrshire. There are a number of clues that can be used to reconstruct the routes that must have been used at this time such as settlement patterns and place names. For a time Scotland had a "golden age" of peace and prosperity. The civilising influence of Queen Margaret, wife of Malcolm Canmore, saw the start of this and the innovative ideas of David I and his successors saw it develop further. New towns were built and the foundations of mercantile trade established. The great abbeys played an important part in this not least because they built bridges and roads but the campaigns of Edward I and later kings put an end to all this. Various sources of evidence allow a reasonable reconstruction of the road network in the middle ages, especially near the end of the period. It was at this time that roads were made the responsibility of parishes where all able-bodied persons were required to work for up to 6 days a year without pay. Known as the statute labour system, it was widely resented and very inefficient. A modification of the system allowed a set sum of money to be paid instead. This helped a little but there were problems with collecting the money. Despite these difficulties a great number of "roads" were built at this time, as well as many bridges. The period also saw the building of military roads in the Highlands after the 1715 rebellion, and the Military Survey maps of the 1750�s which show almost all the roads and tracks in the country. Although there had been some early toll roads, it was not until the mid-1700�s and later that these became firmly established as a means of improving the road system particularly when advances in agriculture and industry made the need for good roads apparent. Counties could apply for an Act of Parliament allowing them to raise funds to construct roads and recoup the money through the collection of tolls. The system proved very successful and resulted in the country having a good network of roads, although the parish roads funded by the statute labour commutation money were not always in good condition. A separate programme of road building in the Highlands and one or two roads in the Lowlands was carried out from 1802 onwards under the Commission for Highland Roads and Bridges. Competition from the railways from the 1830�s onwards and inherent difficulties with both the turnpike and statute labour system led to a review that eventually led to the disbanding of the turnpike trusts and passing all roads over to the newly formed county councils in the 1880�s. Initially all roads were managed by trusts and then by county councils. 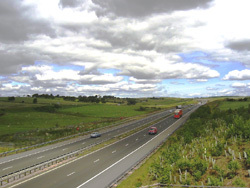 Over the years, considerable improvements were made to the existing roads and new roads built. Many of the main roads today are former turnpikes although now surfaced and with improved alignments. As there could be variations in road standards between counties, the Ministry of Transport took over responsibility for main routes and increasingly set out guidelines and standards to ensure a more uniform road network. Local government was reorganised in 1929 leading to the formation of highway committees in counties and again in 1974 with the formation of regional councils. As these were larger, a more strategic view could be taken of the road network and many major road schemes date from this period. A further reorganisation took place in 1996 when unitary authorities were formed. Research into prehistoric tracks in Scotland has been very limited and as a result very little is known about them. In addition, the time period covered is very long and it is very difficult to assess when a particular track was formed. Nevertheless, some sort of picture can be gained from examining the distribution of finds. The Mesolithic population seemed to favour shorelines, lagoons, lakes and rivers, environments which they could exploit for tools, shelter and food. Neolithic and Bronze Age peoples also used these environments but they practised farming and raising livestock so their settlements were more permanent. Celtic (Iron Age) populations were also farmers and had settled in many parts of the country as shown by Ptolemy�s description of the tribes at the time of the Romans. The distribution of finds in relation to local geography while not exact does at least offer the possibility of identifying many of the routes these peoples must have taken. It is not known if there were any long-distance tracks as are found in England and Ireland although one or two researchers have suggested that in places the Romans used already existing tracks. The Romans invaded Scotland three times. The first invasion was by Agricola in 78 AD and the occupation lasted until the end of the century when there was a withdrawal to the Tyne - Solway line. 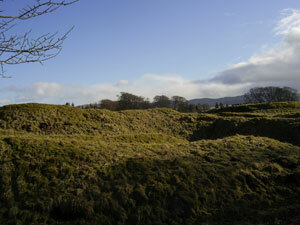 This was followed by the Antonine invasion in 142 AD when the Antonine Wall was built. The occupation lasted sometime into the 160�s when there was a withdrawal to Hadrian�s Wall though a presence was maintained in the south of the country. There were two further campaigns by Severus between 208 and 211 AD. The majority of the roads appear to date from the first invasion. A main road (Dere Street) ran from Corbridge across the Cheviots to Newstead and the Forth near Edinburgh and then probably over towards Falkirk and up towards Stirling. Another main road (Watling Street) ran from Carlisle north to Crawford, continuing on the east side of the Pentlands to the Edinburgh area. An east-west route crossed this near Biggar which may have run from Newstead to Barochan, with an extension to Loudoun Hill. A loop road ran from the westernmost road near present day Lockerbie over to Nithsdale and then northwards to rejoin the main road near Crawford. From the Falkirk area, a road has been traced someway beyond Perth connecting the forts sited at the mouths of the glens. In the Antonine period it is thought a road was built to link the east and west roads through Raeburnfoot, as well as the military road running to the rear of the Antonine Wall. A great deal of work has been done to determine what other roads there might have been and also to fill in obvious gaps between known stretches of road. For example, in the south-west, a road is posited to Glenlochar and Gatehouse of Fleet and perhaps beyond; as well as roads running up the Cree, Ken and Nith valleys into Ayrshire. 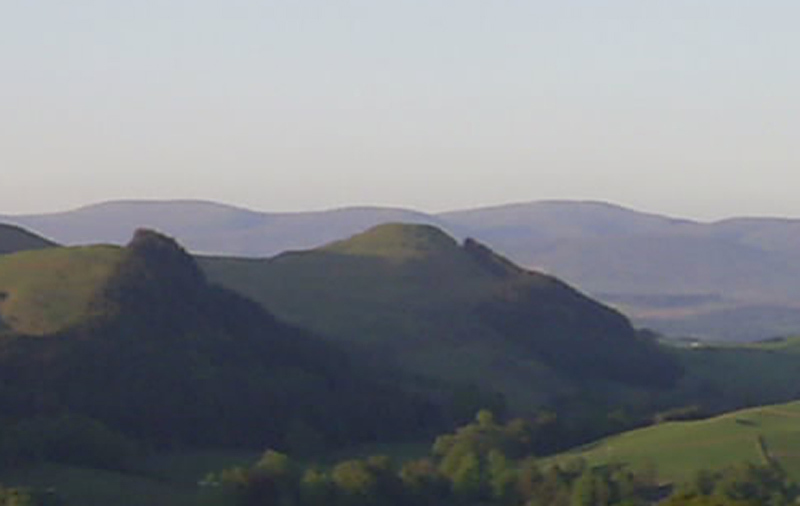 The road to the Loudoun Hill fort may have continued to the Ayrshire coast and it is thought roads may have ran from Castledykes to Crawford and up past Castle Greg. Although this is a complicated period of history and very little work has been done on routes, a number of points can be made that could throw some light on routes at this time. The main territorial divisions of the different races within Scotland, viz. of the Scots, Picts, Britons and Angles, and later the Vikings will each have had their own internal communication routes related to their settlements and to the geography. For example there appears to have been a division between the northern and southern Picts forced on them by the Grampians. As they were still one people, they must have used the passes of the Grampians to communicate. Another example is that higher sea levels meant that much of the area east and west of Stirling was impassable except at one or two places. The whole period was characterised by great unrest with constant battles being fought between the different peoples and even amongst themselves. Where these could more properly be called invasions, for example, the expansion of Dalriada eastwards into Pictish territory, or the Angles northwards as far as Forfar and west into Galloway and Ayrshire, the campaigns must have followed suitable communication routes. Placenames offer valuable clues both to settlements and to routes. The occurrence of names such as tref, bal, ham denoting a settlement can give a very detailed picture of where these peoples lived. Examples of route-related placename elements are balloch, a pass, drochaid, a bridge, conaire, a path, wath, a ford, gate, a road or way. The name Birgham is interesting as it indicates a very early bridge over the Tweed although the course of the river has changed so that the bridge is now thought to be on dry land. Pilgrim routes to Whithorn are thought to have existed from very early on, and there may have been others. 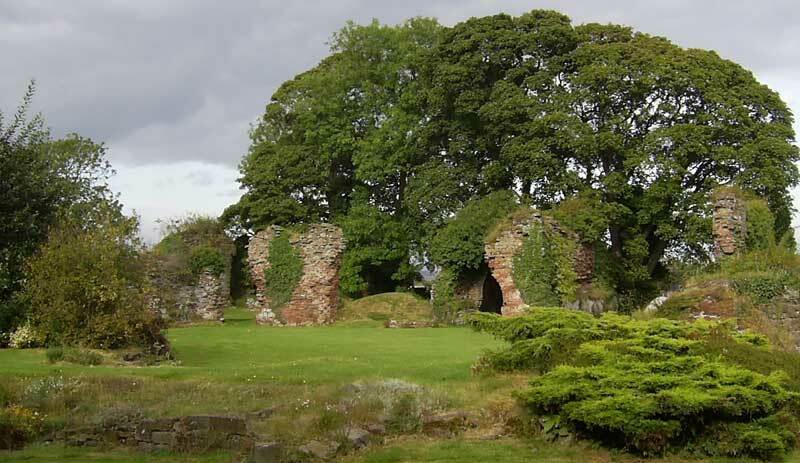 At the start of the mediaeval period, a number of charters were granted to newly formed burghs which listed locations where tolls could be raised on goods coming into the province of the burgh. An example from Ayrshire lists toll points at Maich, Karnebuth, Loudoun, Croseneton and Laicht Alpin which allows us to posit routes from these points to Ayr. It is more than likely that the implied routes were already in use for trade and may have been so for a long time especially as they were on natural communication routes. When David 1 came to the throne in 1124 he, and those who followed, introduced major changes in the way Scotland was governed which had a profound effect on all aspects of life, including roads and transport. David was brought up in the Anglo-Norman court and when he became king called on many of his friends from the court to help him establish his new kingdom. He introduced a variant of the feudal system, encouraged the Church to play a key role in developing the country, promoted local and foreign trade principally through the formation of new towns that were given special trading privileges and formed shires where law and order was administered by sherrifs. The king granted land to his major followers who in turn would provide others with land and in many cases these smaller areas became parishes. Typically they would set up a fortified site which usually had an associated church and usually a mill. As these settlements grew, a network of tracks developed around them. 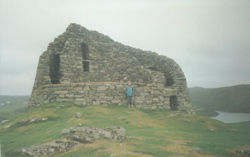 Many of the castles built at this time guarded strategic routes. The burghs with their trading privileges would hold markets and fairs to which the smaller settlements would take their produce. Later in the middle ages a number of the larger towns were created burghs with the right to hold markets and this helped consolidate the existing routes into those towns. The church played a key role as they had skills in building, mining, agriculture and husbandry. Following the king�s example it was common for major landowners to found a monastery and endow it with land. The monks with these skills quickly made the land productive and helped develop trade. It is thought that a number of routes started at this time, or at least were used by the monks and some of these may have been actual made roads as well as bridges. Examples are routes between Newbattle Abbey south of Edinburgh over to the Monklands near Glasgow, Kelso Abbey and Lesmahagow where there was an outlying priory, and Melrose up to Edinburgh. Abbey charters have references to roads used as boundaries to gifts of land. To help pilgrims, and travellers in general, the Church provided spittals where they could rest. While these changes did not apply to the whole of Scotland, they were very widespread and probably the only parts of Scotland where they did not apply were initially Galloway and the north-west highlands and islands. All this ended of course with Edward I, though even here the itineraries of his incursions into Scotland give an indication of routes. At the end of the period we are fortunate to have the maps of Timothy Pont who carried out a survey of Scotland in the years around 1600. These were published in Blaeu�s Atlas of 1664 and some of the maps show roads and others include river crossings and placenames related to routes which indicate where roads may have run. There are also numerous references to roads and bridges both in early charters and in state documents such as the Register of the Privy Council showing that Scotland had a fairly well developed network of routes and in some cases, actual roads in the middle ages. In the succeeding Post-Mediaeval period, from about 1600 to the mid-1700's, the statute labour system was in operation and in theory at least provided a basis for the proper upkeep of roads and for building new ones where required. Responsibility lay with the parish and required people to work for 6 days each year, without pay. Those who did not turn up could be fined. The difficulty was that people did the work reluctantly and had very little idea of how to repair or make a road. There is also some evidence that the system was not fully implemented in some areas. To help overcome this, a "commutation" system developed which allowed a monetary payment to be made instead of working on the roads and this seems to have had some success as it allowed more knowledgeable road makers to be employed. However, it is clear that there were wide variations across the country and the roads were very poor in many places. Bridges were the responsibility of the Commissioners of Supply and a great many were built in this period. It is quite clear that a number of the old bridges replaced at this time were in a "ruinous" condition. There are various sources of evidence which are enough to show that a quite extensive network of routes existed in the 1600�s, both between major towns and to main market towns as well as local tracks and it is these that would have been worked on under the statute labour system. 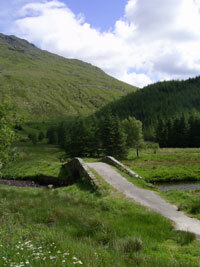 It is at this time that Military roads were built in the Highlands after the 1715 uprising. Under the command of General Wade a network of roads was built linking forts along the Great Glen and Ruthven Barracks as well as linking to the road system further south. This was later extended by Major Caulfield. Another military road was built to Portpatrick for troop movements to Ireland. Measures to suppress the 1745 rebellion made the authorities acutely aware that they lacked adequate maps and in 1746 William Roy was ordered to conduct a survey of the whole country. The resulting maps, known as the Military Survey of Scotland, are at a scale of 1 inch to 1000 yards and give us an almost complete picture of the road network at the time. In the latter half of the 18th century, massive changes in the economy of Scotland led to major improvements in the life of the people. The new enclosures and better farming methods along with the exploitation of mineral resources and the development of industry resulted in a growth of population and better health and living conditions. The Act of Union in 1707 had a crucial part in this as it opened up the large markets of England to Scotland. Improved roads were an essential part of this revolution, helping to stimulate all aspects of the economy and opening new horizons to people by making travel much easier than before. The system which allowed these new roads to be built was the turnpike system, tolls being levied to meet the considerable cost of building them. To build a turnpike, an Act of Parliament was required and once passed, allowed a trust to be formed which could then arrange for the roads to be built. Throughout Scotland, hundreds of trusts were formed and a huge programme of road building started which completely revolutionised travel in Scotland. Coaches became more frequent and journeys faster and more comfortable. There were numerous carters and carriers transporting agricultural produce and raw materials like limestone and coal. The New Statistical Account written by Ministers of parishes in the 1830�s speak almost uniformly of the great changes since the previous Statistical Account written in the 1790�s. Even the parish roads had in many cases been improved. Side by side with the turnpikes was a new network of roads built in the Highlands by the Parliamentary Commission for Highland Roads and Bridges. The 1830�s were perhaps the high point of the turnpike system but it was about that time that railways began to be built. Rail travel was much faster, cheaper and more comfortable and as a result the turnpikes were more and more reduced to taking local traffic and were becoming more uneconomic. The huge debt of the turnpike trusts, the high tolls which were often unfairly applied with some people paying none on a short journey and others having to pay three or four times for an equivalent journey, and the wide variation on how the commutation money was raised led the government to set up a Commission to assess the situation and see how it could be improved. In its report of 1859, the Commission recommended that turnpike and statute labour roads should be under the same management in a county and should be funded by a fairer rating system. They also recommended that the Highland Roads and Bridges be placed with their respective counties. This led eventually to the 1878 Roads & Bridges Act and the Local Government (Scotland) Act of 1889 that re-organised local government. The 1878 Act abolished the turnpikes and statute labour and Section 11 placed the management and maintenance of highways in counties in a County Road Trust, and in burghs in burgh councils. This continued until 1889, when the County Councils took over roads and bridges. The new system worked well enough though interestingly, prior to the motor car, as long distance travel and transport was conducted mostly by rail, many of the major cross-country routes were little used and deteriorated accordingly. The situation did improve with increasing use of motorised transport but even then some through routes could be adequate in one county and very poor in a neighbouring county. This situation was remedied when the Ministry of Transport took over responsibility for major routes to create a strategic network for the whole country that would be to a uniform standard. Another change took place in 1929 when County Councils set up Highways Committees responsible for most of the roads in a county and this continued up to the formation of regional and district councils in 1974 when the new regions took over the roads function. 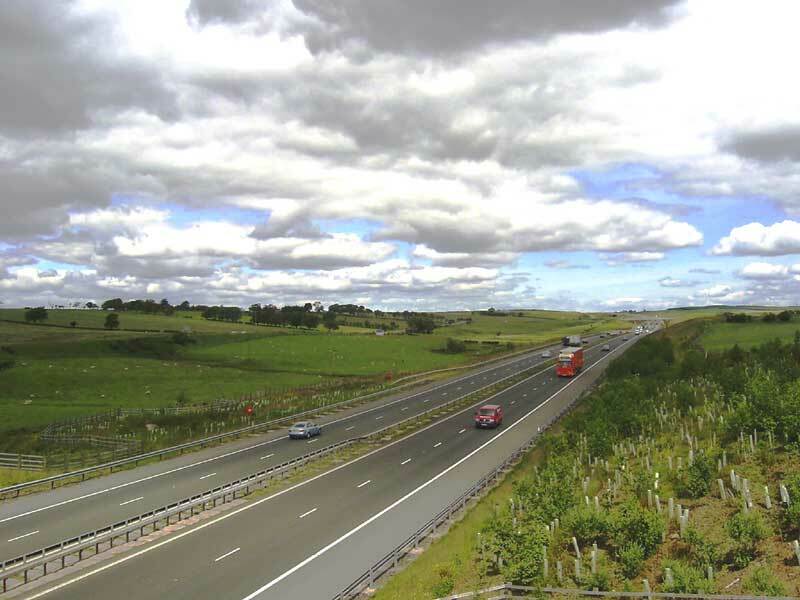 As the regional councils covered larger areas it was possible to take a more strategic approach to the road network they were responsible for and a number of major road schemes date from this time, often with financial grants from Europe. Local government was re-organised again in 1996, this time as unitary authorities. As they covered smaller areas, the roads function was usually incorporated into functions dealing with the infrastructure of the area. Initially funding for major schemes was limited although this is now improving. Funding was made available however for small scale improvements aimed at improving safety and encouraging a shift from motoring to cycling, walking and public transport and this has made a recognisable difference to the urban environment.